وُلِدَ الشيخ وليد الخازن بن شفيق الخازن والسيدة ماري مسعد في بيروت في الخامس من أيلول سنة 1946. أتمّ دراساته الثانوية حائزا" على شهادة الباكالوريا قسم الفلسفة من أنترناشيونال كولدج بيروت، وحاز على شهادة سوموفور من الجامعة الأميركية في بيروت، كما على شهادة في الحقوق من جامعة القديس يوسف في بيروت، وأيضا" على شهادة فرنسية من جامعة ليون في فرنسا مع شهادتيّ تخصّص في القانون الخاصّ والقانون اللبناني، ثم دروس تخصّصية في جامعة يونيفرسيتي كولدج في لندن متخصّصا" في قانون الطيران والفضاء، القانون الدولي للبحر، الشحن البحري والضمان البحري. هو فارس في منظّمة فرسان مالطا ذات السيادة منذ سنة 1998، وعضو في اللجنة التنفيذية لجمعية فرسان مالطا في لبنان منذ سنة 2000. عّين سفيراً لمنظمة فرسان مالطة ذات السيادة في المملكة الأردنية الهاشمية وقدّم أوراق اعتماده إلى جلالة الملك عبد الله الثاني بن الحسين، في 5 حزيران 2007. ضمن النشاطات والأعمال الخيرية التي تقوم بها المنظّمة في لبنان، قام لمدة ست سنوات بتنظيم رحلات حجّ للأخوة المرضى والمعوقين إلى لورد. KHAZEN (Walid, El-, Cheikh), Attorney-at-Law. Born on Sept. 5, 1946 in Beirut, Lebanon. Son of Cheikh Chafic El-Khazen, Magistrate, General Director at the Ministry of Interior and Mrs., ne Marie Massaad. Married in 1973 in Beirut to Gloria Ayoub, 4 children: Sary (1974), Chafic (1977) Nour (1980), Tayma (1985). Educ. : International College: Baccalaureate; University St. Joseph: Licence in Lebanese Law; Licence in French Law; University de Lyon: Postgraduate studies, Air & Space Law, International Law of the Sea, Carriage of Goods by Sea, Marine Insurance. 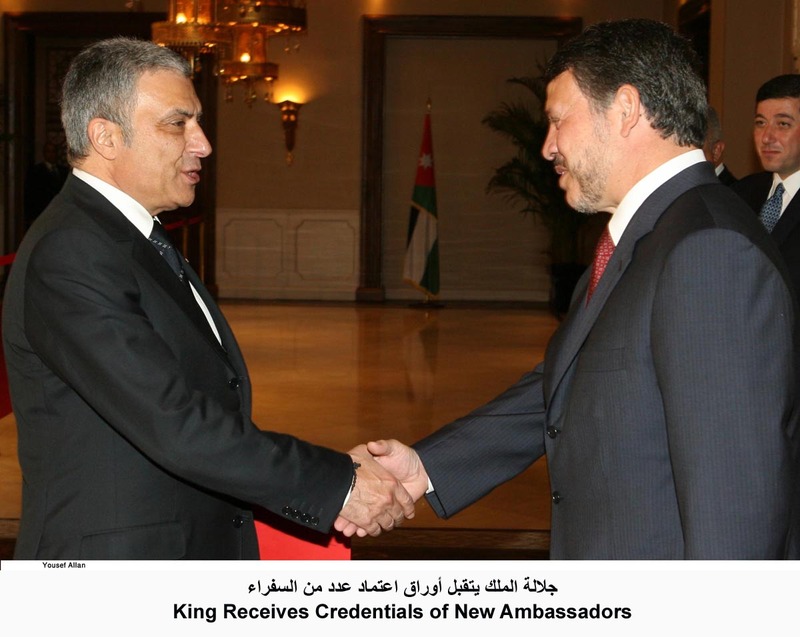 An-nahar newspaper published on april 25th, 2003, Cheikh Walid El Khazen "Ilj Al Gharb"
Cheikh Walid El Khazen was appointed as Ambassador to the Hashemite Kingdom of Jordan. In summary the Order of Malta remains true to its inspiring principles, summarised in the motto "Tuitio Fidei et Obsequium Pauperum", defence of the Faith and assistance to the poor and the suffering, which become reality through the voluntary work carried out by Dames and Knights in humanitarian assistance and medical and social activities. Today the Order carries out these activities in over 120 countries. The Order has diplomatic relations with 93 countries - many of which non-Catholic - and missions to major European countries, as well as to European and international organisations. The Order of Malta is neutral, impartial and non-political, which is why it can successfully act as a mediator between States. To view the prestigious document pls click "Read More"
KHAZEN (Walid, El-, Cheikh), Attorney at-Law. Ministry of Interior and Mrs. ne Marie Massaad. Sary (1974), Chafic (1977), Nour (1980), Tayma (1985). Of the Sea, Carriage of Goods by Sea. Marine Insurance. Career: Jun. 1968: Graduation. Avocat Stagiaire; Jun. Law & Business Law. Sports: Swimming, horseriding. Cheikh Walid el Khazen video when being awarded by the Sovereign Order of Malta with the Pro Merito Melitensi Cross.